The Pound pulled back from its 7-month high as the dollar found support amid better-than-expected GDP figures. The latest Brexit developments show that chances of a no-deal Brexit are increasingly unlikely, as PM May agreed to give the Parliament a chance to vote for an extension, if her deal gets rejected by lawmakers. Today. the UK is set to release minor money figures, while Markit will publish the February Manufacturing PMI expected at 52.0 vs. January's reading of 52.8. 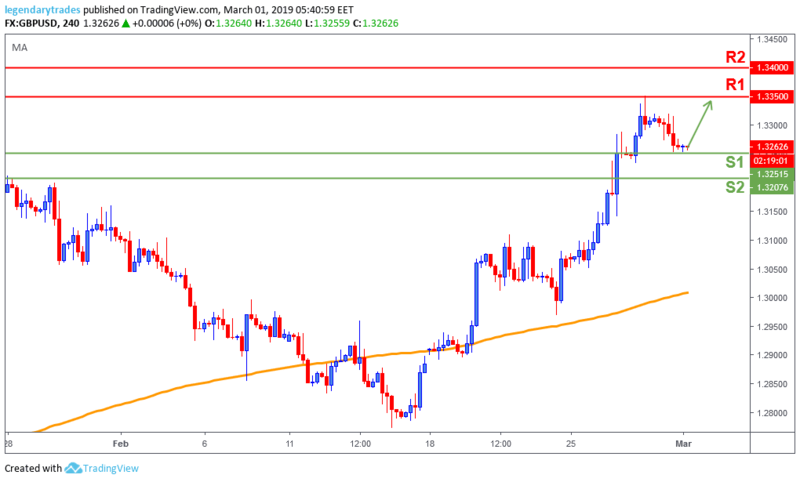 The Pound pulled back and found support at 1.3250 (S1), after reaching as high as 1.3350 (R1). A very healthy pullback so far on the Sterling, the bias is still with the bulls as long as price remains above 1.32 (S2). Price is looking to retest 1.3350 (R1) once again, a break above that level, will open the doors for a possible 1.34 (R2) test.